Did I ever tell you my dad loves roses? His house, one town over, has purple, orange, white, pink and red roses. He was That Guy who would ask neighbors for cuttings. Then he'd come home, stick them in the front garden and water them until only he could walk through without snatching something on thorns. Nary a rooting hormone, small greenhouse made of an upturned water bottle or a drop of fertilizer. He didn't clip his roses with a sanitized clipper; he would saw them off with an old kitchen knife he kept for gardening. HE DIDN'T EVEN DEADHEAD! My dad's entire key to success was watering a lot and somehow it was enough. I'm a more fastidious gardenner and after taking care of the roses for two years I swore them off. All that trimming and deadheading and spraying for bugs is way more work than just watering a lot. So when a friend mentioned wanting to plant roses in her yard my first response was Ick Face. My second was to offer to grab some cuttings from dad's garden. Figuring there has to be a better way than my dad's tried and true Sever, Plop and Water I turned to Pinterest. Pinterest insists rooting a rose cutting inside a potato before planting will ensure moisture and nutrients are maintained. It claims this is how pioneers spread roses through America back in the Oregon Trail days. Pre-Emptive Update: Pinterest is a big liar and now I have twigs in potatoes. I don't know when I'll see her so I just popped the stalks in left over containers from last week's mums along my garden. This should ensure they get waterred enough. The one on the right is the purple and the one on the left a prolific pink one the color of those impatiens. The blooms are the size of a fist and each end yields at least four roses at once. It looks like a bunch of bridal bouqets stuck in a bush when blooming. 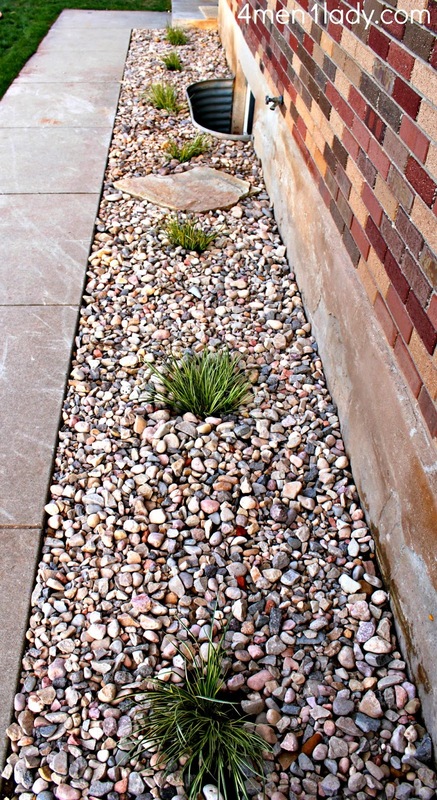 The guys at http://www.4men1lady.com/vertigo-and-outdoor-landscaping/ landscaped their drainage gravel and a bulb went off in my head. See that akward little square of gravel to the back on the right? Here is a better angle. Its about 1-2" worth of those tiny landscaping rocks Depot and Lowes sell over soil. I always wondered why the previous owners didn't just pave it or leave it as grass but that blog up there says it helps with drainage. Our house has had problems with water filtration so that makes sense. Know what else makes sense? That blog says they planted stuff in order to help soak up the water! MORE PLANTS TO BE HELPFUL! See that little Home Depot bag next to the gravel? Spoiler Alert: It has a plant! A tiny hosta! Although after looking at this picture I am going to move it further from the house. I don't want it too close to the window because I know how large hostas can get and I just remembered that plastic square is the dryer's exhaust and probably not conducive to life. June Fever Hosta - $1.99 at Home Depot and probably left over from last week's 3/$12 Hosta Blow-out. Guess what this unpeeling disaster is? Left-over cement from a fix at my parent's house. I was rushing against the dry time and couldn't find anything to put it in so just went with this styrofoam cup my husband probably bought on July 5th 2003. Remember I was excited to have purchased pre-mixed cement? Nope, I had to mix that stuff and my consistency was wonky. If I'd thought it through I would have at least stuck a tea light in the cement and pretended it was deliberate sand castle shaped "art." I don't know why its two shade of gray - I probably didn't mix enough or it was drying already or something. That flea market sedum continues to baffle me. Hopefully once those pink flowers bloom I will be able to ID it! You are really into plants aren't you? I wish I knew all that. Well I know it now but I had to google Hosta. Do they do well in California weather? When I see posts like this is when I miss my country home, or even a farm, to say the least; where we lived for 13 years and had a huge flower garden as much as veggie patch and corn, chickens,etc. You know so much about plants and what they mean. Thanks so much for this interesting post and for your lovely visit. Really a lot of great info in this post. Never knew the potato trick. About 6 or so years ago I bought June Hostas for all of my sisters. Our sweet mothers name was June so when I saw them I knew we needed them! Just looking at your sedum it looks to me that it is Autumn Joy. It blooms pink in the fall. Thanks for sharing with Share Your Cup.